The socio-cultural, economic, religious and philanthropic activities of the Jews of India are reconstructed in this study with the help of both archival materials and contemporary sources. The focus of this study is on the contributions of the Jews in India and also highlights the question of Jewish identity in the historical and social aspects and shows how their identity is manifested and preserved by the Jews in their everyday life. This objective study has also dealt with two other recent Jewish communities, the Bene Menashe Jews of Manipur and Mizoram and the Bene Ephraim Jews of Andhra Pradesh as well as the Indian Jews viz. Cochini, Bene Israel, Baghdadi and Bene Menashe Jews settled in Israel. Dr. Dalia Ray, daughter of Late Hon'ble Justice Bankim Chandra Ray, retired Judge of the Supreme Court of India; and Late Banalata Ray), is the chip of the old bloc. After completing graduation (B.A. Hons.) in History from Lady Brabourne College, Calcutta, she took her Masters Degree in Modern Indian History from the Jadavpur University. She took her Bachelor of Law Degree from the University of Calcutta. She was a Junior Research Fellow of the University Grants Commission and took her Ph.D. from the Jadavpur University in Modern Indian History. Her thesis was published under the title, 'The Bengal Revolutionaries and Freedom Movement' (1902-1919) from Delhi in 1990. After working as a First Class Judicial Magistrate and as a Civil Judge in the West Bengal Judicial Service for 9 years, Dr. Ray returned to the Bar of the Calcutta High Court in 1998. She is now, a practicing Lawyer. Dr. Ray has published a number of papers in the academic journals and research journals. Her papers on the Jews of Calcutta in the Proceedings of the Indian History Congress and All India Oriental Conference etc. have been, well received and appreciated. She is a frequent contributor to the daily press of Calcutta. She has written a few papers in Bengali also. Her second book entitled 'The Jewish Heritage of Calcutta' was published in 2001 from Calcutta while her third book, 'The Parsees of Calcutta' was published in 2005 from Calcutta. Apart from Social Service, Dr. Ray is a gifted singer of light classical music and has released two cassettes of her songs in 1997 and 2001. 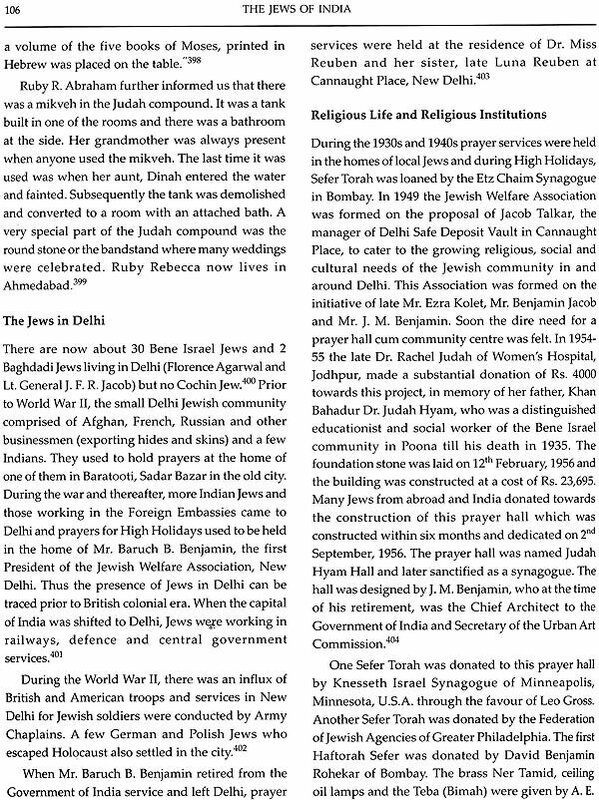 It is indeed a matter of pride that Dalia Ray has written about the 'Jews of India' in a very comprehensive manner. While many books published earlier on this subject have been written about parts of the Jewish communities of India, this book carries the added bonus about the Jewish immigrants to India from Central European countries and a chapter on the Indian Jews settled in Israel. Readers will find that even though the current majority of Indian Jews are Bene Israelis, the author covers the Bagdadi/Iraqis, Cochinis, Bene Menashe and Bene Ephraims who are also very important in weaving the fabric of the Jews of India. This book shall fulfil the expectations of those readers looking for a wider understanding of the Jewish identity and community that identifies with India. Even though the author resides in Kolkata, her travels and extensive research about the Jewish community across India has been most impressive and much appreciated. I am sure that readers will be enlightened with Dalia's unique observations and experiences. I would like to congratulate Dalia Rayon her tireless efforts and enormous work done in writing this book over several years. I wish this book much success due to its systematic analysis on the subject of 'Jews of India'. The public ovation received from the Jews of Calcutta, Israel and other places abroad for my first book, 'The Jewish Heritage of Calcutta', inspired me to undertake a comprehensive study of the Jews of India. Of all the diaspora communities, the Jews of India are the most interesting but least known. The Cochin Jews of Kerala, the Bene Israel Jews of Maharashtra and Gujarat and the Baghdadi Jews of Bombay, Poona and Calcutta are now receiving proper attention from all over the world. The Jews in India seldom experienced oppression and faced no religious persecution in sharp contrast to the diaspora in Europe where they were subjected to inhuman treatment by the European Christians due to anti-semitism preached by Hitler. Another important and vital distinction between the Jews of India and their counterparts in the rest of the world is that the local Jews have maintained and retained their identity without being assimilated with the Hindus. The fact that the Jews of India formed a miniscule community and their marginality among the other foreign communities settled in this ancient land makes them more interesting. Though the Jews in India seldom actively participated in the Indian Freedom Movement, they were not hostile to Indian Independence. In fact, some Bene Israel of Bombay supported the Indian cause. However, India's attainment of independence from the British rule in 1947 and the birth of Israel in May 1948 gave them the green signal for their exodus en masse to their Promised Land as well as to other places in Europe, America and Australia. In this study the questions raised are several. How could this community of a microscopic minority maintain its identity despite microscopic pressure from various quarters. 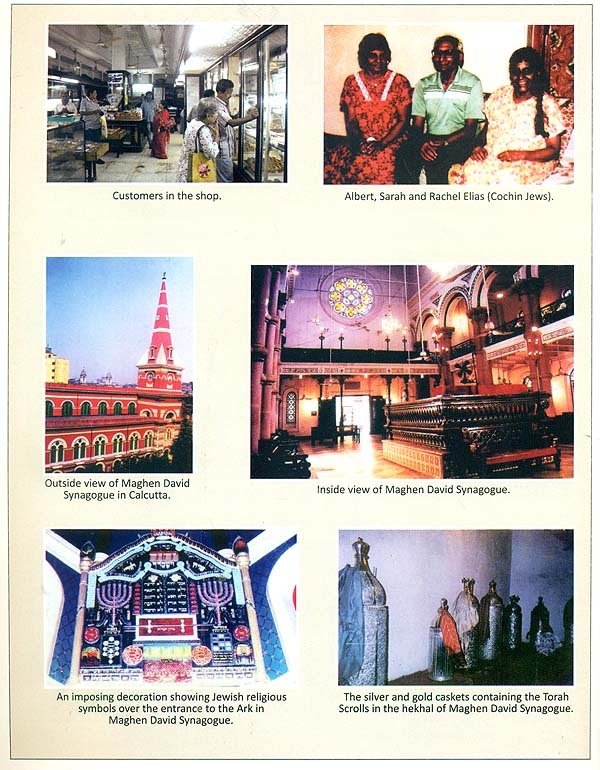 The socio-cultural, economic educational and philanthropic activities of the three major Jewish communities in India, viz., the Cochin Jews of the Malabar Coast, the Bene Israel Jews of greater Bombay, Poona, Gujarat and Delhi and the Baghdadi Jews of India's port cities, especially, Bombay and Calcutta with special reference to their heritage in these places have been delineated in this study. I have focussed my attention on questions of identity-historical, social and how their Jewish identity is manifested in their everyday life, dietary laws, religious rites and customs. 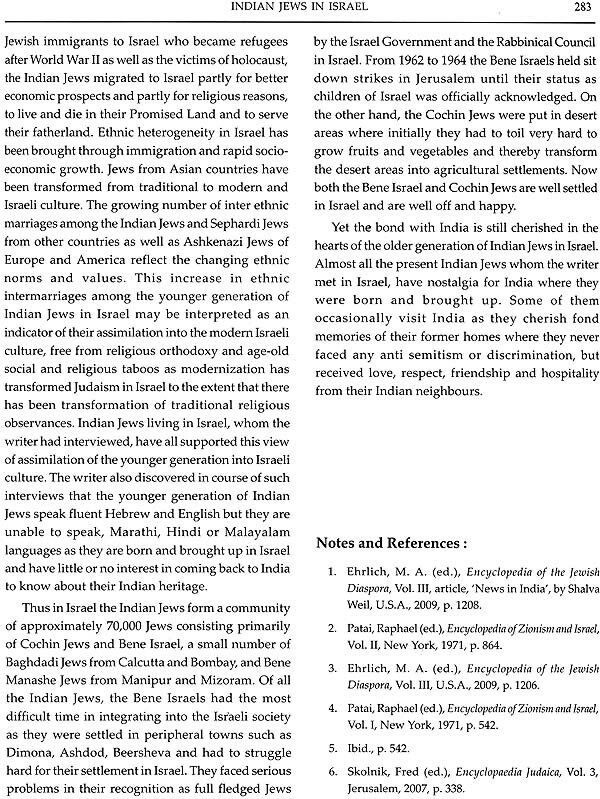 This study pays special attention to the status of the Jewish communities as foreign immigrants in the Indian society by preserving their own cultural identity. The Jews in India lived a free, happy, prosperous and peaceful life and they contributed much to the host community and to India at large in terms of business, industry, philanthropy, culture, art, architecture and beautiful edifices. Besides the three major Jewish communities, two more have emerged to the forefront-the Bene Ephraim Jews of Andhra Pradesh and the Bene Menashe Jews of Manipur and Mizoram. The claim of the Telugu Jews that they are descendants of Bene Ephraim Jews, one of the lost tribes of Israel and the claim of the Kuki-Chin-Mizo people of North-East India tracing their lineage from the Bene Menashe Jews, another lost tribe of Israel are evaluated in this study. Finally I have dealt with the vital questions as to how far the Indian Jews have been able to settle in Israel, their occupation, social and religious life and the extent of their assimilation with the Jews of the Middle East, Europe and Africa settled there. In chapter one, I have dealt with the Cochin Jews or the Jews of Kerala. I have discussed their origin, background, social, cultural, religious and economic activities, the colour distinction and other differences between the White, Black and Brown Jews of Cochin have also been discussed. 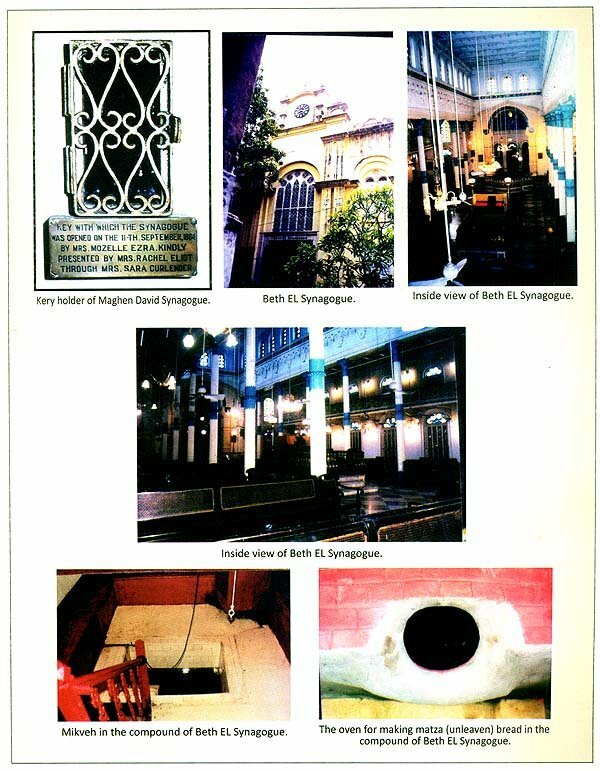 This chapter also highlights the Jewish institutions such as synagogues and cemeteries in Kerala. In chapter two, Bene Israel Jews of Bombay (Mumbai), Poona (Pune), Ahmedabad, Delhi as well as Baghdadi Jews living there have been dealt with. 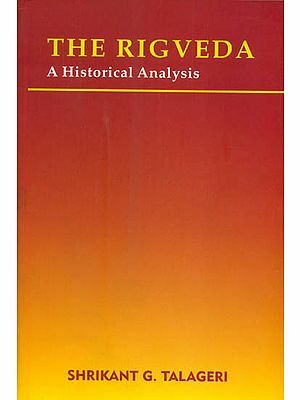 This chapter focuses on the origin of Bene Israel and Baghdadi Jews, the Bene Israel settlement on the Konkan Coast and subsequently to other places in Bombay, Poona and Delhi as well as Baghdadi settlement initially in the port city of Surat and consequently to Bombay and other places, the social, economic, religious and cultural life of Bene Israel and Baghdadi Jews, their institutions such as synagogues, schools, cemeteries etc., their contributions to the public, economic, philanthropic and social life and finally the present Bene Israel and Baghdadi Jews living there. 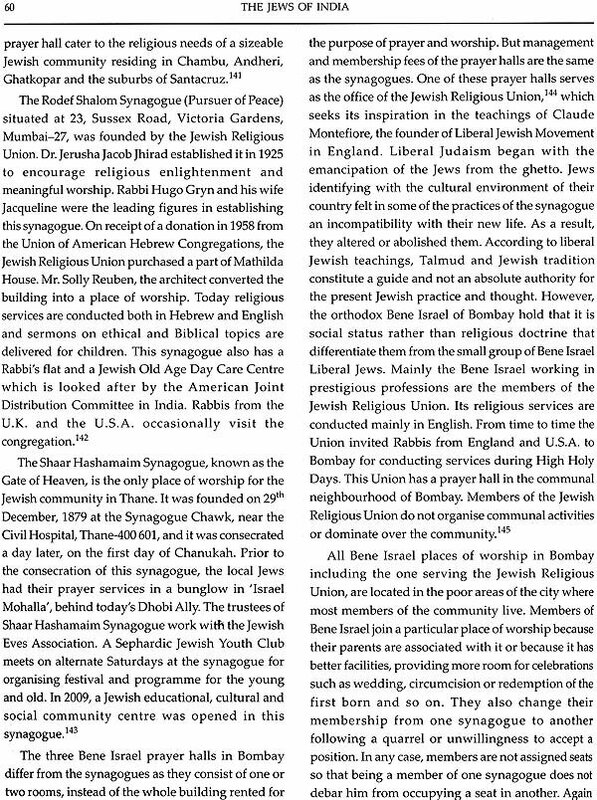 Chapter three deals with the Calcutta Jewish community. 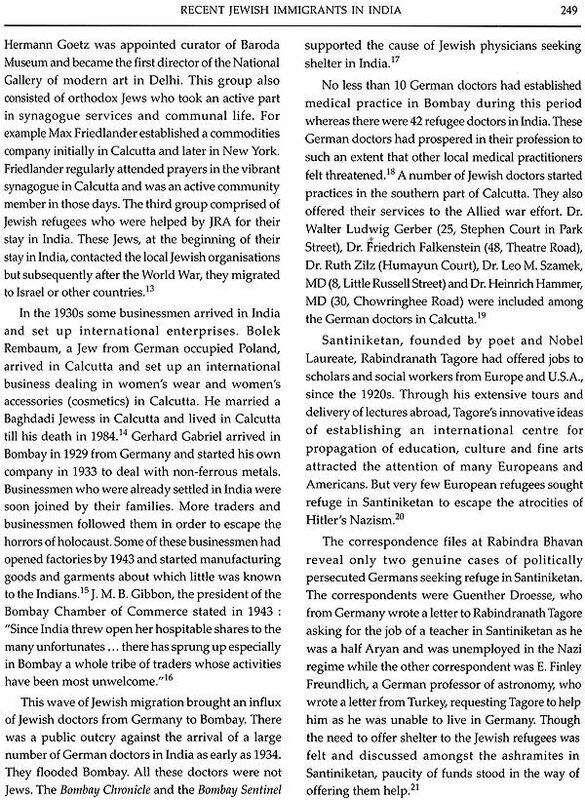 This chapter has discussed elaborately the background and origin of the Calcutta Jews, their categorisation into Baghdadi, Ashkenazi, Bene Israel and Cochin Jews, their social, religious, business, commercial, philanthropic and cultural activities, their contributions to the industrial and business life, and public life of Calcutta, the Jewish institutions such as clubs, associations, schools, synagogues and cemetery, and the present condition of the Jewish community. 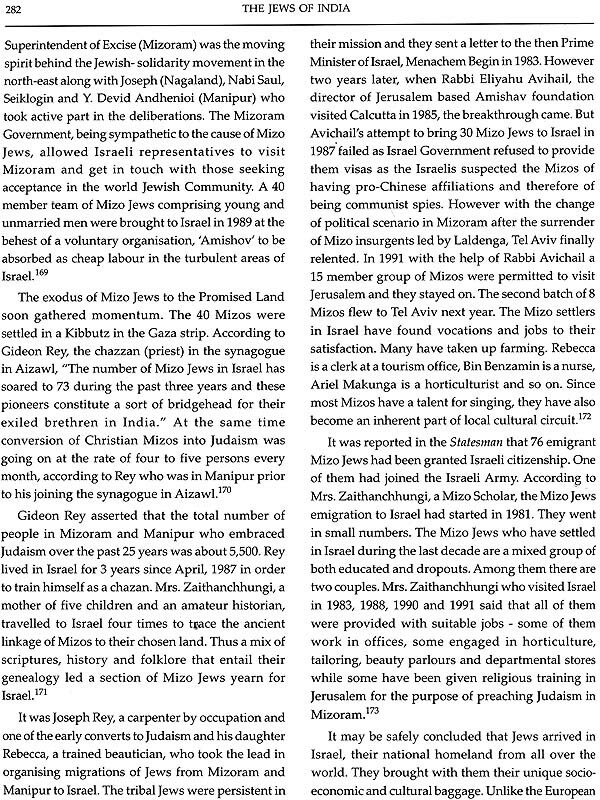 In the fourth, chapter, I have discussed the activities of the Bene Menashe Jews of Mizoram and Manipur. Originally belonging to Kuki-Chin-Mizo tribes, they were subsequently converted to Christianity by the missionaries during the British colonial rule of India. 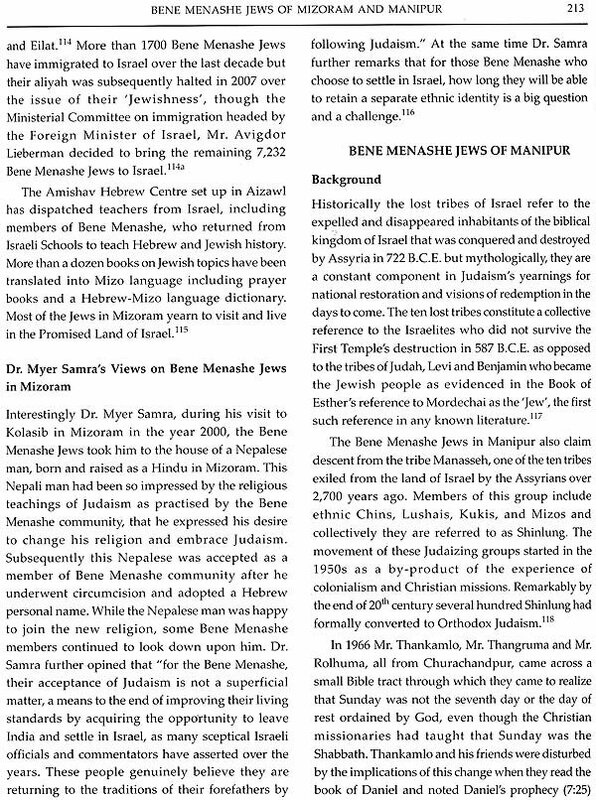 I have highlighted the various factors which led these people to believe that they were descendants of Bene Menashe, one of the lost twelve tribes of Israel and so they were Jews and under the Law of Return they must go back to their Promised Land (Israel), their settlement in Aizawl and other places of Mizoram, Imphal and Churachandpur, Jewish institutions in Mizoram and Manipur, Bene Menashe immigration to Israel and the important role played by Rabbi Eliyahu Avichail and his organisation, Amishav, as well as by Shavei Israel in helping the Bene Menashe Jews to train themselves for conversion to Judaism, in financing the Hebrew centres in Mizoram and Manipur and in sending Rabbis and Hebrew teachers to impart religious education to them and finally arranging for their immigration to Israel. This chapter has also dealt with the Jews living at present in Mizoram and Manipur. The fifth chapter deals with a little known Jewish community, viz., the Bene Ephraim Jews of Andhra Pradesh. Like the Bene Menashe Jews of Mizoram and Manipur, a group of Madiga Christians living at Kottareddipalem, Vijaywada, Ongole and Machhlipatnam have claimed their lineage from Bene Ephraim tribe, one of the lost tribes of Israel, on the basis of some oral traditions or the Kabilah. Shmuel and Sadok Yacobi, two Mattaniah Christian brothers, embraced Judaism in the 1980s, adopting Hebrew names and led this movement of the Bene Ephraim. They are also called Telugu Jews as they speak Telugu, a Dravidian language of India. This chapter also highlights their institutions, associations, religious life, and problems faced by them in their social and religious lives. 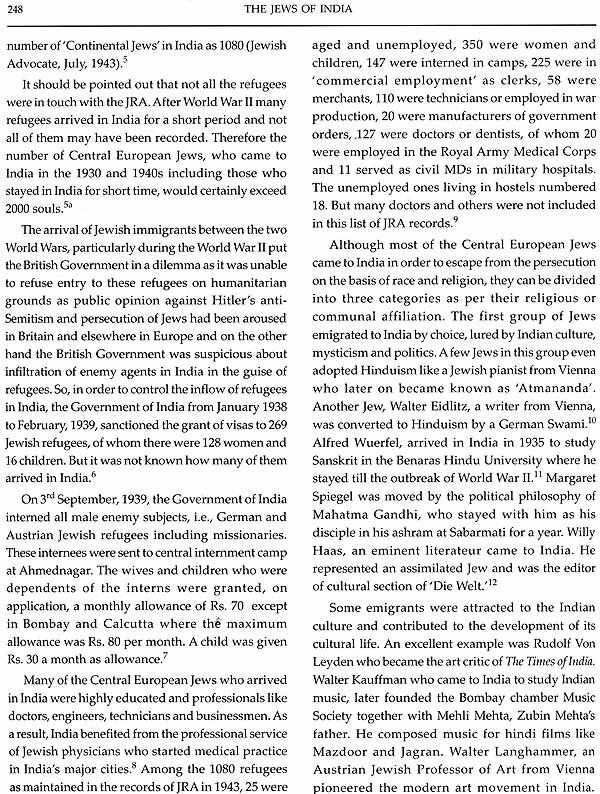 I have devoted the sixth chapter to highlight the recent Jewish immigrants in India who were European Jewish refugees from Austria, Hungary, Czechoslovakia, Poland, Romania and Germany to escape persecution from Hitler's Nazism and holocaust. 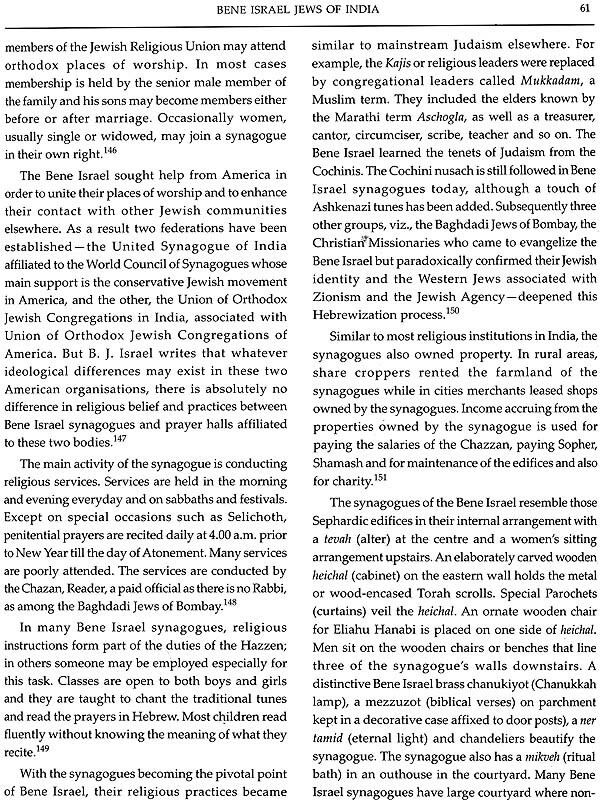 The Oriental Jews from Persia, Bukhara and Afghanistan, who landed in India in the 1930s and 1940s are also discussed in this chapter together with their relations with the local Jews. I have devoted the seventh and last chapter to the Indian Jews, viz. 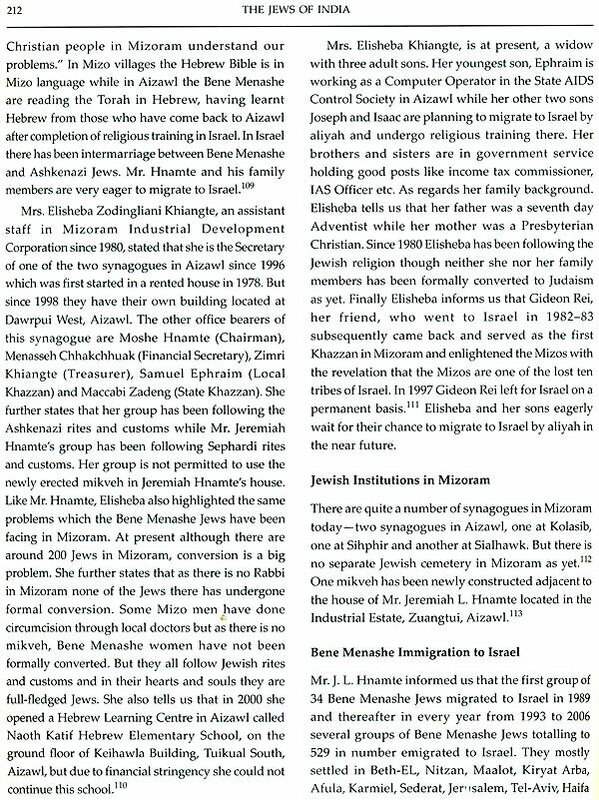 Cochini, Bene Israel, Baghdadi and Bene Menashe Jews who have emigrated to Israel and have settled there permanently. I have not omitted to deal with the factors leading to their immigration, places of their settlement, problems faced by them in Israel, their socio-cultural and religious life in Israel, the present Indian Jews in Israel and the assimilation of the younger generation of Indian Jews in Israel into modern Israeli life and culture due to the growing number of inter-ethnic marriages between Indian Jews and Sephardi Jews from other countries as well as with the Ashkenazi Jews of Europe and America. Finally in the last chapter, I have summarised and evaluated the contributions of the three major Jewish communities, viz., the Cochini, Bene Israel and Baghdadi Jews of Calcutta and Bombay, to the economic, cultural, philanthropic and public life of India. I have also highlighted the fact that inspite of being a microscopic marginal community, the Jews of India made remarkable achievements while preserving their Jewish self-identity in the backdrop of Indian environment. This work is the outcome of interviews; field study supplemented by archival materials and published sources. 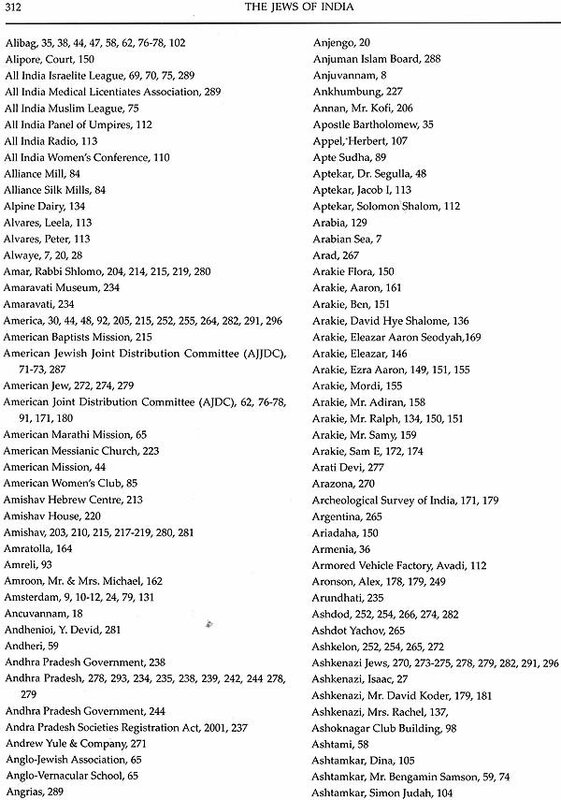 The wholehearted support and cooperation of the members of the Calcutta Jewish community, the Bene Israels in Mumbai, Pune, Ahmedabad, and Delhi, the Kerala Jews in Ernakulam and Co chin, the Baghdadi Jews in Mumbai and Pune, the Bene Manashe Jews in Mizoram and Manipur and the Bene Ephraim Jews in Andhra Pradesh as well as the Bene Israel, Baghdadi and Cochin Jews in Israel have made the field study a success. 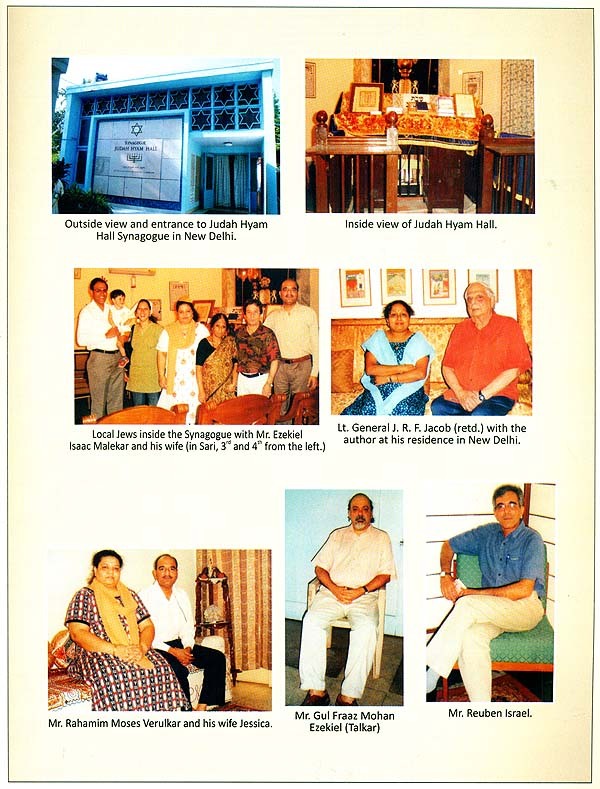 Prominent among them helped the author by presenting their personal collection of books, family papers and pictures. The interviews with the Bene Israel, Cochin and Baghdadi Jews, both in India and Israel and interviews with the Bene Menashe Jews and Bene Ephraim Jews in India were rewarding. The author acknowledges the help and assistance of the staff of the National Library, Calcutta, the State Archives, Calcutta, the National Archives and Jawaharlal Nehru Museum and Library, New Delhi. Special thanks are also due to Dr. Myer Samra, Lt. General J. F. R. Jacob and David E. Nahoum who helped the author in overcoming all hurdles. The photographs appearing in this work were taken by the author herself. The author is sanguine that discerning readers will bear with her for the shortcomings of this work. The Jewish diaspora in India is not a homogeneous community. Yet the Jews of India are the most interesting community and their marginality makes them somewhat unique and spectacular. The Jews found a comfortable home in exile in India where they never faced any persecution but were regarded with affection and respect by their neighbours. Waves of Jewish immigrants came to India from different parts of the world during the 18th and 19th centuries. The Jews made their home in three different cities in India - Cochin, Bombay and Calcutta. 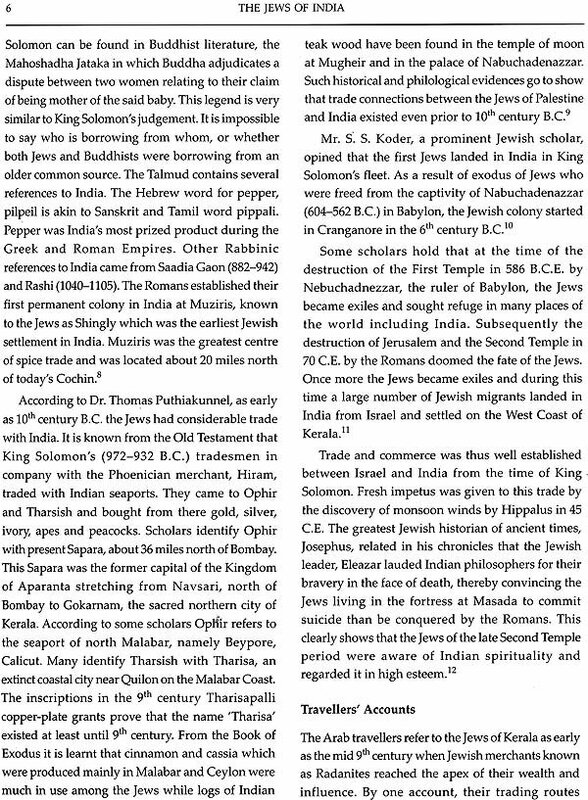 The Jews had contact with the Malabar Coast from time immemorial. 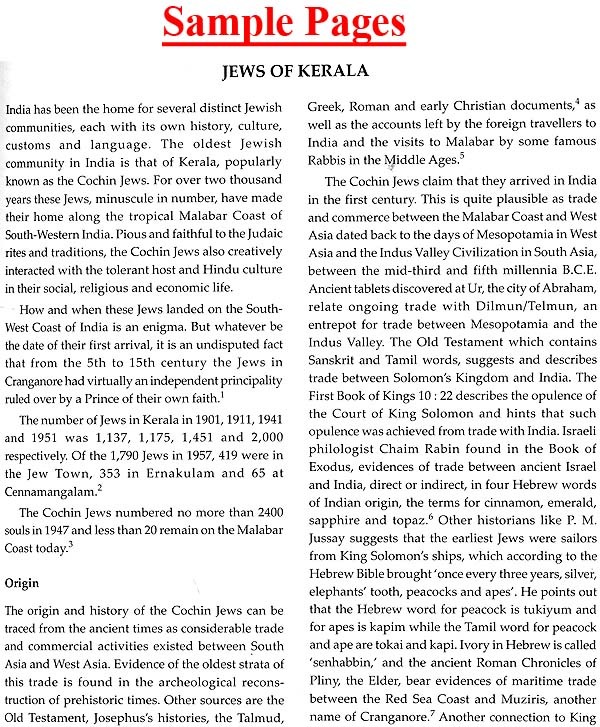 The Jews who settled at Cochin and other places in Kerala had been in South India for around thousand years. Cranganore, on the western coast of Kerala, is reputed to be the first settlement of Jews in India. The claim of the Cochin Jews, that their ancestors settled at Cranganore immediately after the destruction of the First Temple in the 6th century B.C, is based on tradition. It is probable that they reached their first abode by sailing in King Solomon's fleet. The local rulers granted them an autonomous district of Cranganore where they lived for 1000 years or so. How and when they arrived in this ancient port of Cranganore or Shingley is still obscure. They were agriculturists, spice traders, merchants and also served the local rulers as their Prime Ministers and military generals. Jews from European countries also settled on the Malabar Coast. The strategy adopted by the Cochin Jews for their survival in a new cultural environment was by maintaining a fine balance between Judaism and Hinduism as they adopted the local Malayalam language, some priestly and royal symbols of Hinduism in their minhag (the way Halakha or Jewish rituals and customs are observed). Yet they maintained their Jewish identity by adhering to the basic tenets of Judaism, knowledge of Hebrew, and by strictly observing their rites and customs without showing disrespect to Indian cultural values. The White Jews of Cochin were immigrants from European nations after 1500. The Black Jews were descendants from the original settlers. The Cochin Jews followed Sephardic rites and customs like the rest of the Jews of the East. After the birth of their Promised Land, most of the Cochin Jews opted for aliyah to Israel as they wanted to serve their Promised Land. The Bene Israel (Children of Israel) of Bombay is the largest Jewish segment in India. They maintain that they are the descendants of the Twelve Lost Tribes of Israel who were shipwrecked off the West Coast of India, not far from Bombay, in the 2nd century B.C E. Only seven couples survived and their descendants had no contact with their co- religionists in other parts of India till recent times. Having been isolated for centuries from the mainstream of Jewish life and influenced by the social system and culture of their Indian neighbours, their co-religionists looked down upon them and regarded them as not 'pure Jews' and as such the Bene Israel Jews were not acceptable to the Cochinis or Baghdadi Jews for the purpose of marriage. The Bene Israels were divided into two endogamous units, the Cora or White Bene Israel and the Kala or Black Bene Israel according to their origin, the former believed to be descendants of the seven couples who landed on the Konkan Coast and the latter known to be off springs of union between Bene Israel men and non-Bene Israel women. According to their tradition, the Bene Israel took up oil pressing soon after their arrival in India and they were called 'Shanwar Tellis' (Saturday oil pressers) who abstained from work on Saturdays. But, later on, they gave up oil pressing and took to agriculture and other occupations. The Bene Israel have been something of a puzzle to their fellow Jews as they nestled for so long in the shadow of the Indian caste system. The Bene Israel spoke Marathi, the local language; adopted Hindu dress, rites and customs. Thus, in many ways, they assimilated to their environment and to a life-style not usually associated with Judaism-unlike Islam and Christianity which have confronted Judaism for many centuries-this is the peculiarity of Indian Jewry's situation. Unlike the other Indian Jews, the Bene Israel resemble in colour and customs the people of India. Persecution was never known to them. They lived for many centuries along with their Hindu, Muslim and Christian neighbours happily and peacefully. However the issue of racial purity of the Bene Israel Jews is singular because of its Indian context. Due to their assimilation to the Indian social system and culture, the Bene Israel's self- identity is more Indian than Jewish. However, after the emergence of Israel many Bene Israel migrated to Israel in order to serve their Promised Land and to link themselves to the Jewish State so that common religion would provide a scope for maintaining social relations with the Sephardi and Ashkenazi Jews of Europe in Israel. The Arabic-speaking Baghdadi Jews constituted the latest wave of Jewish immigration in India. The pioneers of this Arabic wave from Babylon came to India towards the end of 18th century. The Baghdadi Jews in India also included Jews from Persia and Afghanistan. Some of them settled in Surat around 1775; others moved to Bombay around 1790 and later branched out to Poona and Calcutta and further to Rangoon, Singapore, Shanghai and Hong Kong. The flow of migration from Iraq, Aleppo, Yemen and other Middle-Eastern countries to India in general is impossible to chart. The Baghdadi Jews differed from the Bene Israel and the Cochin Jews in many fundamental aspects liturgically, linguistically and economically. A closely-knit group, they were the heirs of a rich culture and tradition, deeply rooted in Jewish learning. 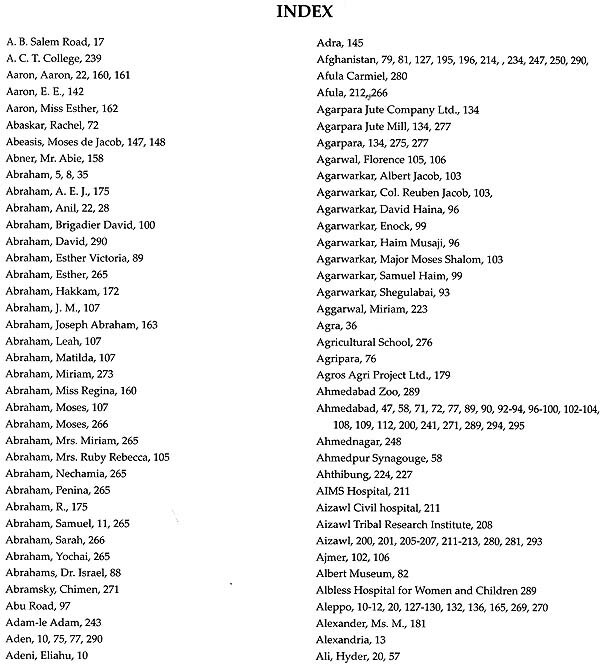 The fair-complexioned Baghdadi Jews at first freely used Bene Israel synagogues and cemeteries in Bombay. But after they became Westernised by adopting European mode of life and their leaders were accepted in British society, they became English- speaking and began to regard themselves as superior and different from their Indian co-religionists, and started isolating themselves by questioning the racial purity of the Bene Israel. In Calcutta, also, the Baghdadi Jews looked down upon the Bene Israel and Cochin Jews and did not mix with them during religious festivals or social functions. It is curious to note that a kind of apartheid was followed even after death, for, in the Jewish cemetery in Calcutta at Narkeldanga Main Road, the graves of Bene Israel and Cochin Jews are segregated from those of the Baghdadi and Ashkenazi (European) Jews. The Baghdadi Jews migrated to India for the purpose of trade and commerce and to save themselves from the persecutions of Daud Pasha in Baghdad in 1817-31 and the forcible conversion of the Meshed Jews in Persia in 1839. Many of them became prominent traders and industrialists while the Sassoons in Bombay and Eliases in Calcutta built huge business empires and they contributed much to the commercial and economic life of those metropolitan cities. The Baghdadi Jews seldom mixed with the local Jews and never intermarried with them. They treated the Bene Israel and Cochin Jews as outcastes and never gave them an equal status. India's attainment of freedom from the British rule left the Baghdadi Jews of India apprehensive of their future. Finally the birth of their Promised Land also encouraged them to opt for aliyah and settle in Israel permanently. Those who had properties in India could not leave India immediately. The prosperous Baghdadi Jews in India never migrated to Israel but settled in Europe and America; while the less-affluent Bene Israel and Cochin Jews migrated to Israel and became a part of the local population by embracing a life of hardship and toil. Recently the Kuki-Chin-Mizo tribes in Manipur and Mizoram who were converted to Christianity by the European missionaries during the British rule are claiming their lineage from Bene Menashe, one of the lost twelve tribes of Israel. Their claim is mainly based on some similarities between their tribal rites and customs with the Jewish rites and some conjectures and visions on Judaism which some of them had in their dreams. Though not formally converted to Judaism, these Bene Menashe Jews have been sincerely following the Torah and observing Jewish rites and customs with the help of Rabbi Avichail in Israel who visited them in the 1990s. With the help of his organization 'Amishav' and later on with the help of 'Shavei Israel', another organization, a small number of Bene Menashe Jews have been able to migrate to Israel and settle there on a permanent basis. Many of them have joined the Israel army and are serving the nation. The so-called Bene Ephraim or Telugu Jews of Andhra Pradesh have traced their lineage from Bene Ephraim, another lost tribe of Israel on the basis of Kabila or oral traditions. These Telugu Jews are actually Magida Christian converts and untouchables. Like the Bene Menashe Jews they are not formally converted to Judaism but they have been ardently following the Torah or the Old Testament and the Jewish rites and customs. They are also striving hard to migrate to Israel but the Israeli Government as yet has neither recognized them as Jewish nor has given the permission for their aliyah. In reality the claims of both these groups of Jews are not corroborated by any authentic evidence, whether documentary or otherwise. However the Israel Government has accepted the Bene Menashe Jews of Manipur and Mizoram by allowing them to settle in Israel. How far the claim of the Telugu Jews will be accepted by the Israel Government still remains uncertain.